When you buy a reverse osmosis system, you should keep in mind that the reverse osmosis membrane must be changed occasionally. You can change this RO membrane while troubleshooting and remedial actions. First of all, when you make an attempt to change the RO membrane, you should shut down the system and drained it as well. Before you install, you have to keep track of the serial numbers of the new system to remember the intended location in the system. It will allow you to get a clear idea of the actual performance as you can compare test data with the real-time system performance. Furthermore, you will be required to remove both of the vessels end-caps and it will permit you to take away elements with the normal direction of flow. Also, it will prevent the brine seals from getting jammed against the pressure vessel. In addition to this, you can insert the replacement elements in the feed end of the vessel and other elements can be pushed through as well. At this moment, you can carefully lubricate the U-Cup brine seals and inter-connector O-Rings by glycerin to aid the fitting procedure. Besides, every inter-connector must have O-Rings installed and the U-Cup brine seals have to be installed with the open groove of the seal while facing the upstream of every element. Plus, don’t place the brine seals on each side of an element. Now, after the replacement procedure is completed, you should limit the gaps with shims. The last part of the caps should be installed now and you should also start the reverse osmosis system. Additionally, the RO system should be filled up with low-pressure water before the initiation the high-pressure pump. Afterwards, you would allow the new elements to rinse. It will clean any residual preservative chemicals. After doing all these things, you will collect the system operating data when the plant performance is stabilized. I would suggest you to change the RO membrane in every 2-3 years and at the time of replacement, you should change all the cartridges simultaneously. Be mindful of the fact that you need to shut down the water supply system beforehand. First, you will start with disconnecting the tubing from the membrane cap. 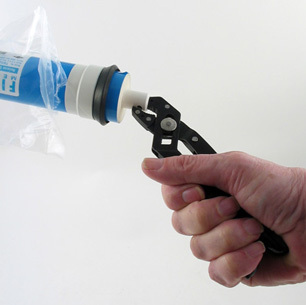 Secondly, you will unscrew the cap on the last part of the membrane housing. Now, you would slide out the used membrane and discard. At this stage, you will need to take away all other cartridges and sanitize the entire system. (It necessary to do this always). Afterwards, you will just insert the new membrane and ensure that it is completely seated into the other part of the system. Next, you will screw the cap back to the housing and make sure that the O-ring is still intact. Finally, just re-connect the tubing to begin the reverse osmosis system.